The 2017 Toyota Camry is currently one of the most popular cars in America, and Santa Ana, Culver City, and Manhattan Beach drivers have been eager to discover whether this celebrated sedan will continue to stand at the front of its segment. As the latest industry reviews show, there’s no need to worry. The 2017 Toyota Camry delivers state of the art performance and efficiency right off the bat with a 2.5L four-cylinder engine. It produces up to 178-hp and 170 lb.-ft. of torque while achieving an enviable 25 mpg in the city and 35 on the highway*. If you prefer your drive to involve a little more adrenalin, opt for the 3.5L V6; its 268-hp and 248 lb.-ft. of torque is capable of taking you from zero up to 60 mph in just 6.2 seconds. The people over at KBB listed the Qi wireless charging pad as their favorite feature, and there’s plenty else to get excited about. Even entry-level models are fitted with keyless entry, a rearview camera, and 6.1-in. Entune touchscreen, while available features include Dynamic Cruise Control, Entune App Suite, and a 10-speaker JBL GreenEdge audio system. 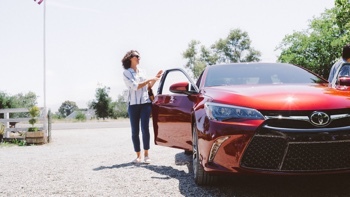 Reviews of the 2017 Camry reflect its status as one of the most trusted family vehicles across Santa Ana, Culver City, and Manhattan Beach; as such, safety has been closely scrutinized. Luckily, the Camry has been earning good ratings from institutions across the county. Automotive critics can be notoriously picky, and the Camry rests in one of the market’s most competitive segments. Be that as it may, the vehicle continues to rise above and beyond expectations; if you’d like to see how it measures up for yourself, just pay a visit to Marina Del Rey Toyota, located at 4636 Lincoln Boulevard, today.